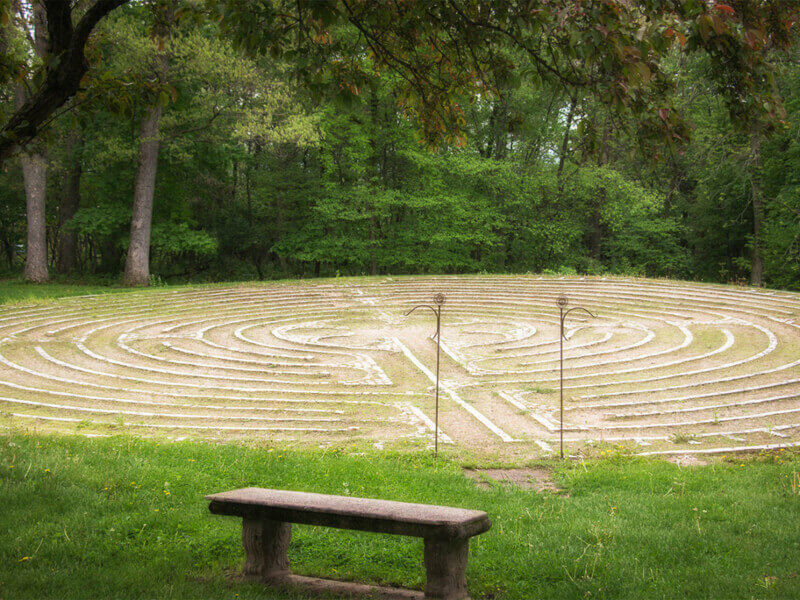 We invite you to walk the labyrinth and discover a new, yet ancient way to pray, to meditate. The labyrinth is an ancient spiritual tool, founded as early as 200 B.C.E. Its history includes use in Crete, Tibet, Greece, Celtic spirituality, early European art, and in the Christian tradition. It is a spiritual tool and an effective metaphor for life’s journey for believers of all traditions. Any person who chooses with intention to walk the path is welcome to do so. Constructed and assembled by 45 volunteers in 1999, our outdoor labyrinth consists of 6,000 limestone bricks placed end-to-end to form a perfectly round circle encompassing the symmetrical path walkways to the center. Walking the quadrants in this peaceful atmosphere among the natural surroundings enhances one’s meditation experience, usually exceeding expectations of the labyrinth. The outdoor labyrinth is open at all times, weather permitting. The indoor labyrinth is available for walking most days. We suggest you call (608) 748-4411 before coming to be sure of its availability.